A little dragon and his favorite book make for a combustible combination in this clever picture book with a surprise ending. It’s nearly Cedric the dragon’s bedtime, and for Cedric, bedtime means storytime! When his mother reads him his favorite book, he likes the story so much that he wants to hear it again…and again…and again! Cedric’s mom understands that the best stories are ripe for repetition, and she tries very hard to be patient. But sometimes dragons will be dragons—which is why this bedtime tale ends with an incendiary surprise! 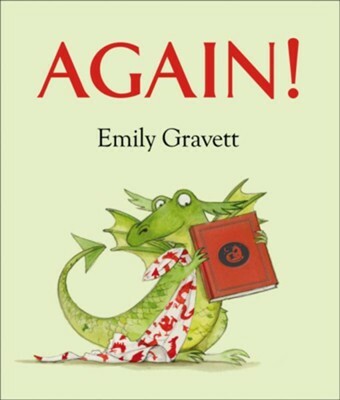 Emily Gravett is the author and illustrator of Matildas Cat, Again!, Wolf Wont Bite!, Blue Chameleon, The Odd Egg, The Rabbit Problem, Dogs, Spells, Little Mouses Big Book of Fears (winner of the Kate Greenaway Medal), Little Mouses Big Book of Beasts, Monkey and Me, Meerkat Mail, Tidy, and Old Hat. Her first book, Wolves, was the winner of the Kate Greenaway Medal and the Boston GlobeHorn Book Honor Award for Illustration. Her second book, Orange Pear Apple Bear, was a Quills Award finalist, on the shortlist for the Kate Greenaway Medal, was a Publishers Weekly Best Book of the Year, and a Kirkus Reviews Best Book of the Year. Emily lives in Brighton, England, with her partner, their daughter, and the family dog. Visit her at EmilyGravett.com. "Gravett, that master of the metafictive die cut, returns for a savvy bedtime satire...should strike a chord." "Gravett takes a slight idea and builds cleverly upon it to offer a fresh take on a familiar scenario." "Gravett’s latest experiment with metafiction imagines the possible trajectory of a child’s appeal to hear a bedtime story ad infinitum...Youngsters will delight in deciphering the visual narrative in their own multiple readings and will relate to the range of emotions displayed by their scaly stand-in." "This is a creative bit of fun to which many a tired parent and enthusiastic child will relate, and the dragon aspect will appeal to many youngsters as well....The boldness of the pictures and brevity of the text will make this a sure-fire winner for group storytimes and patient parents with plenty of energy may find it suitable bedtime fare as well." I'm the author/artist and I want to review Again!.